For the past 6 days I enjoyed being "Missionary of the Week" at Elim Lodge, north of Peterborough (seek link in the sidebar). I had the pleasure of getting to know Dave and Mindy Reynolds and their sons David and Joshua. Dave was the speaker for the week at Elim. He pastors Grace Baptist Church in Sarasota, Florida. The ministry was rich as Dave spoke from Paul's letter to the Colossians in the morning sessions and taught about Heaven during the evening services. 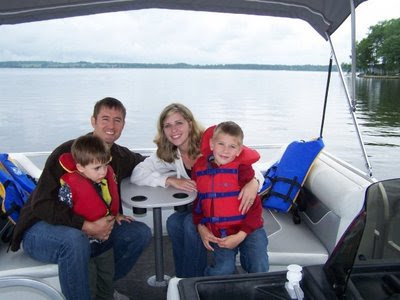 Here's a picture of the Reynolds family as we cruised on Pigeon Lake with Captain Dave (James). God bless you, Dave and Mindy, as you serve Him effectively there in Florida. It was a pleasure spending time with you!